Raya is an 8-year-old little girl who loves life. She is always smiling and finding ways to laugh and have fun. 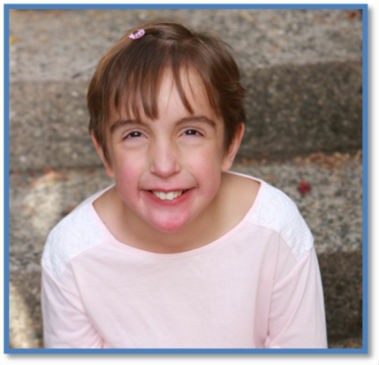 Raya was born on September 23, 2010 with a rare genetic condition called, Sotos Syndrome. This syndrome is caused by mutations in the NSD1 gene. This particular gene is important to the body, because it provides instructions for making a protein that give chromosomes their shape. The NSD1 protein is involved in the growth and development of the human body. Raya was around a year-and-a-half when doctors completed in-depth genetic tests, and eventually diagnosed her with the syndrome. Raya has many medical challenges she faces daily. She receives multiple therapies including speech, occupational, vision and physical. She also enjoys, and benefits greatly from horse therapy. She has grown very fond of horses and can easily bond with them. Despite many challenges, Raya remains a loving and sweet little girl. She is filled with joy and loves to help others, whether it be assisting around the house or offering to play, she is a great friend. Raya will be adopted as a Sparrow to Lone Pine Elementary School. Students at Lone Pine will work hard to raise money for Raya through sponsored community service and fundraising projects.